OptaPlanner 6.2 has made a big step forward for the Vehicle Routing Problem (VRP), Traveling Salesman Problem (TSP) and similar use cases. The new feature nearby selection enables it to scale to bigger problems much more efficiently without sacrificing potential optimal solutions (which is common for inferior techniques). 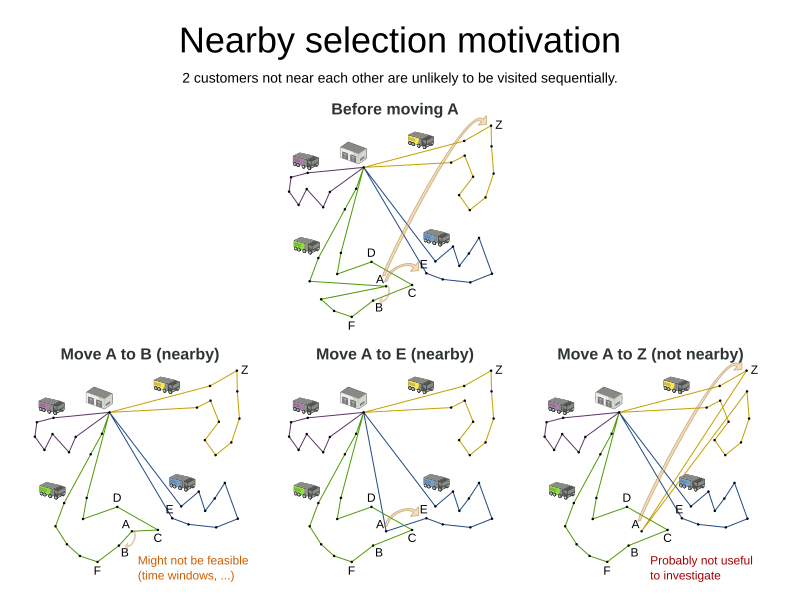 Let’s take a closer look at nearby selection with the Vehicle Routing Problem. In this use case, we have to deliver items to a number of geographic locations with a number of vehicles. Each vehicle must respect its capacity (hard constraint) and we need to minimize the total travel time (soft constraint). Of course, there will be additional business specific constraints in practice. Moving location A behind the nearby location B is likely to be an improvement. Still, we need to consider other moves too, because other constraints (such as time windows) might make this an infeasible (or a less rewarding) solution. Moving location A behind the nearby location E is likely to be an improvement over the original solution. Due to other constraints (such as vehicle capacity), it can even be the best move. Moving location A behind the non-nearby location Z (in the yellow chain) is unlikely to be an improvement. Although we should note that we can’t rule it out entirely, because other constraints (such as time windows) might make it to only move that leads to a feasible solution. In general, we observe that moving to nearby locations is usually more profitable. Do notice that the set of nearby locations differ from location to location. In practice, benchmarks show that normal distribution (which is giving the same selection probability for B and Z) doesn’t scale well. One traditional way to deal with this scaling issue is partitioning (also called geo-fencing): Before solving, the locations are divided in clusters and the vehicles are distributed across them. As demonstrated in a previous blog, partitioning heavily sacrifices solution quality for speed. So I’ve implemented a different approach called nearby selection: for each location we favor moving to nearby locations. Notice that unlike in normal selection, the chance to select B or C is much higher. And unlike in partitioning, we can still select C or E.
Block distribution: Only the n nearest are selected, with an equal probability. Linear distribution: Nearest elements are selected with a higher probability. The probability decreases linearly. Parabolic distribution (recommended): Nearest elements are selected with a higher probability. Beta distribution: Selection according to a beta distribution. Slows down the solver. 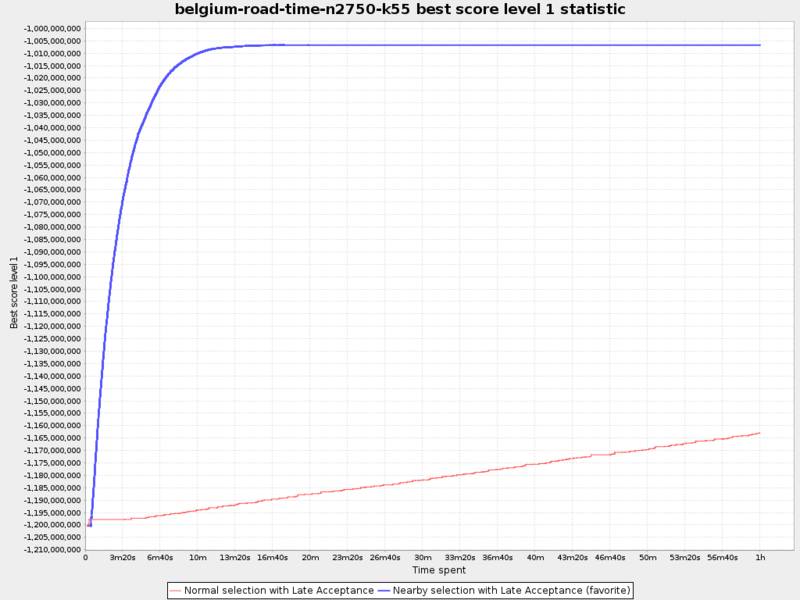 Below are the results in a big VRP dataset with real-world time distances (collected from OpenStreetMap with GraphHopper) with 2750 locations. In the nearby selection configuration, I 've used a parabolic distribution of the 40 nearest locations. 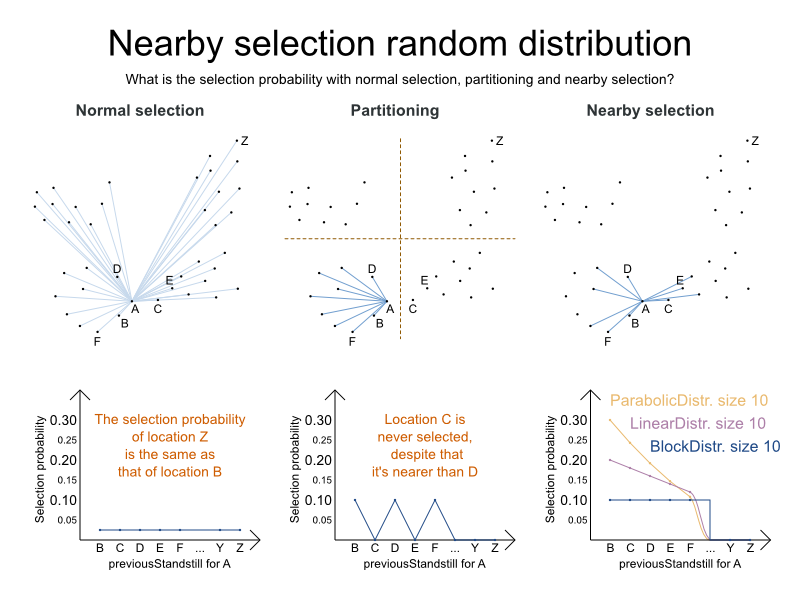 The scalability gain by nearby selection is huge. If you’re working on a VRP use case and it needs to scale better, upgrade to OptaPlanner 6.2 and use nearby selection! Don't want to miss a single blog post? How much faster is Java 11?